Happy New Year everyone! I can’t believe 2014 is over and done with! (In all honesty, I usually say “I can’t believe it’s already [insert month here]. What have I done with my life? ?”) I’m quite far behind in the things that I’ve been meaning to share (weird life stuff, major holiday crafting, fantastical dreams/goals), but rather than start the new year with review of the past, I thought it best to start with something new. 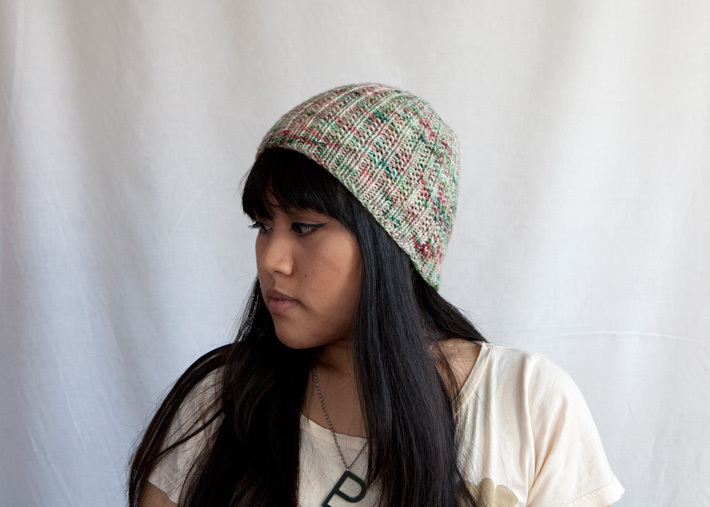 So, I give you a shiny new pattern- for free!– the Flynn Hat! 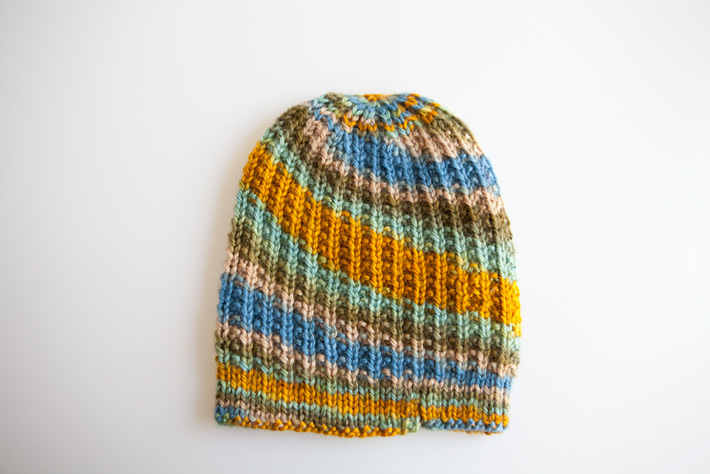 I also used this pattern to make a hat for my dad as a Christmas gift, using Lorna’s Laces’ Shepherd Worsted in the Lake Bluff colorway, which pooled in a fun, exaggerated spiral way. Opposite side of the same hat. Really. 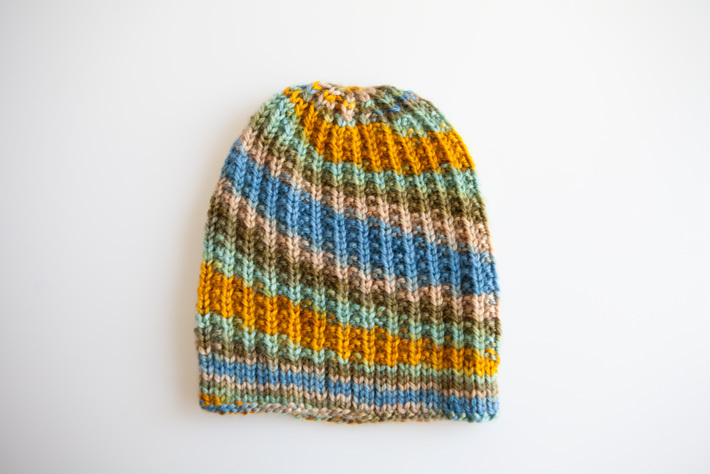 If you’re not a knitter and want one of your own, I’ve made a few available for sale in my etsy shop! To celebrate the new year, there’s a coupon code for free domestic Priority/discounted International First Class shipping. Approximately 140 yards of worsted weight. Sample shown in Voolenvine Yarns‘ Deco Worsted (100% superwash merino, 218yds per 100g) in the “Deck The Halls” colorway. *To change the sizing, change the number of cast-on sts by 12: increase by 12 sts to make a larger hat or decrease by 12 to make a smaller hat. Alternatively, you can change the needle size. Cast on 96 sts, join in the rnd, being careful not to twist sts, and place marker to indicate beginning of rnd. I recommend the German Twisted Cast-On; it’s a touch more elastic than the Long-Tail Cast-On. The Cable Cast-On would also be a nice choice. Work 2×1 rib for 1.25″. 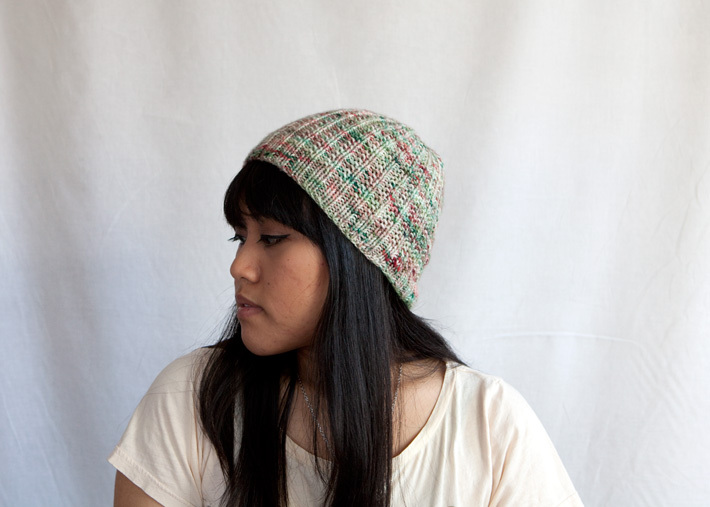 Repeat these last two rnds until hat measures 6.5″ from cast-on edge, or until desired length. The decreases at the crown will add approximately 1.5″ in length. D1: (Ssk, k2tog, k1, p1, k2, p1, k2, p1) eight times. 80 sts rem. D2: (K2, p2, k1, p2, k1, p2) eight times. D3: (Ssk, k1, p1, ssk, k2tog, k1, p1) eight times. 56 sts. D4: (K1 p2 k2 p2) SEVEN times. k1, p2, k2, p1, sl1, remove marker, move sl st back to lefthand needle, replace marker. (The last st now becomes the first st of the next rnd). D5: (sl2tog-k-psso, p1, k2tog, p1) eight times. 32 sts. D7: (K1, sl2tog-k-psso) across. 16 sts. D8: Ssk, k2tog across. 8 sts. Cut yarn, leaving a tail at least 18″ long. Thread tail through rem sts and pull tight to close. Weave in ends. A quick soak and light blocking may help relaxing any stitches, especially the decreases, but other than that, you are good to go! All content is © Emmyelle 2015 unless otherwise noted. This pattern is intended for personal non-commercial use only. Charity donations and commissions from friends are cool though! No portion of this pattern may be reproduced without express permission. Thanks!